I had a fun night of imaging with my friends Dali, and Andy. We had a few venues planned because there was a possibility of fog, and a partly cloudy sky. 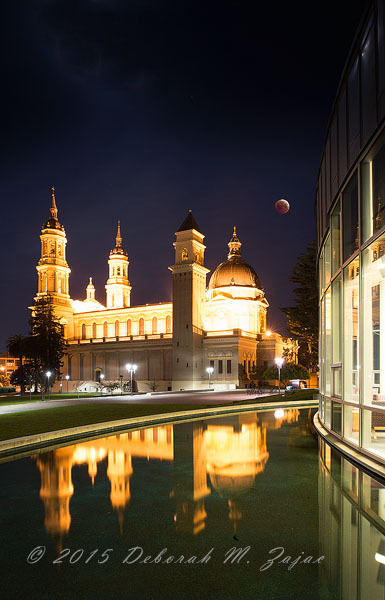 Our Plan A was to shoot the April 4th Total Lunar Eclipse over St. Ignatius Cathedral in San Francisco since this Eclipse fell on Passover and Easter Week-end it would tie in perfectly. Starting with Plan A. We arrived just before 2AM, set up, and began shooting our images. I had planned my shooting position so that I could capture the reflection of the Cathedral in the little pond, and the glass wall of the library, but they had left the Library lights on so the reflection wasn’t good, and I didn’t think I’d be able to get the Moon reflection, but one can always hope. We were well into our series, and talking then shortly before 4AM the lights on the Cathedral shut off. We were disappointed when that happened so, we decided to move to our Plan B position for Totality since we still had an hour to go. We figured we would be making at least one composite image from all we had shot already so, if we shot Totality at our Plan B location we could composite it in to an earlier image(s) from St. Ignatius for our “What If we stayed” image. So, we moved to Plan B: The Palace of Fine Arts. To make this image I used my Nikon Wide Angle 17-35mm lens for the foreground, and just before Maximum I quickly switched lenses to my Nikon 80-200mm lens and made several images of just the Moon in Totality with it. This image is a composite with one frame from each lens. 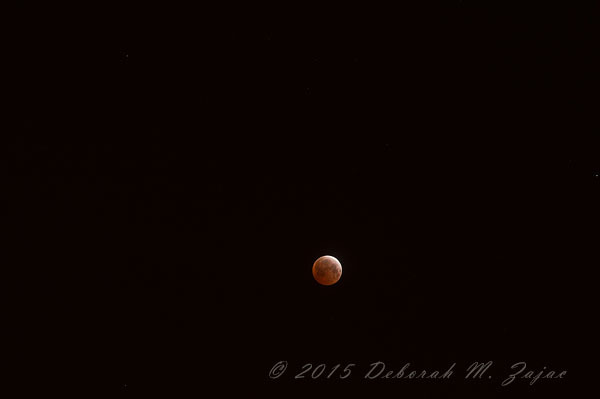 I resized the Moon from 200mm to look the same size it did to my eye at Totality or Maximum. Shooting with the Wide Angle lens the magnification is so little that the Moon looks tiny. For this 3rd Lunar Eclipse in the Tetrad I wanted to have a nice foreground interest along with the Moon at Totality becasue the two prior Eclipses I focused on the Moon and used only my Telephoto lens. Earlier I mentioned that this was the 3rd Lunar Eclipse in the Tetrad. What is a “Tetrad” you may be asking? “Total lunar eclipses are rare – only about one in three lunar eclipses are total. About four to five total eclipses can be seen at any place on Earth in a decade. Here’s my “What if we had stayed” composite image from St. Ignatius. 2 frames Nikon Df one frame for the foreground and one for the moon. The Moon has been resized to look how it would have looked. 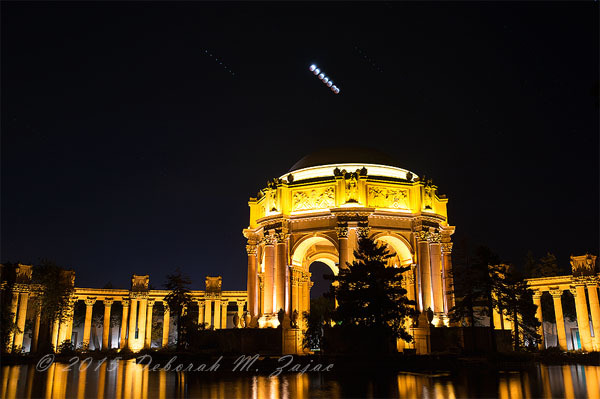 Here’s a partial sequence of how the Eclipse looked over the Palace of Fine Arts- This is 8 frames of the The Total Lunar Eclipse from partial to a minute until Maximum. All 8 frames were shot with the same camera, lens, and settings. I was manually timing the frames at 2 minute intervals except the last one which is about a minute from the frame before. Nikon Df| AF-S Nikkor 17-35mm f2.8@ f8| 8 seconds| ISO 400| Tripod. You can see how small the Moon is when shooting this close to the foreground interest with a wide angle lens. This was shot at 17mm. Knowing how tiny the Moon would be is why I wanted to use my Telephoto lens to shoot the Moon at Maxium and composite it in in development. The way our eyes can see a scene like this is pretty amazing. My eye saw the Moon much larger than my lens can. 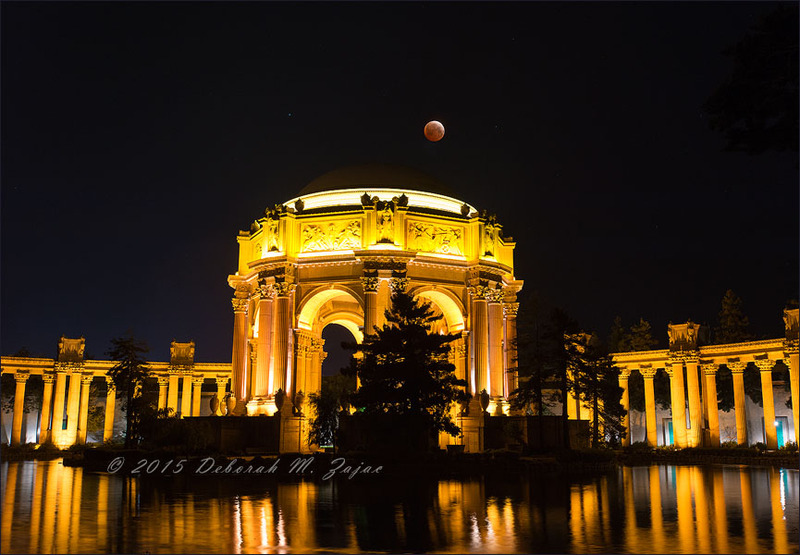 -I wish I hadn’t switched lenses just before Totality and stuck to my original thought of taking at least one image with my wide angle lens of Totality before switching lenses so, I would have had a complete sequence to stack at the Palace of Fine Arts. -If possible take 2 rigs and shoot long and telephoto, and/or a time-lapse. -The lights finally clicked in my brain about focal length, and distance and how it effects the size of the Moon in the image. This knowledge will be used again, and again when I make images of the Moon in the future. …and last but not least …we could have stayed at St. Ignatius. Our lighter images in the beginning of the series would have kept the image from being too dark once stacked into the final image. I’m hoping we can turn all these lessons into something good in September for the fourth and last Total Lunar Eclipse in this Tetrad. That date is September 28, 2015, but for me on the West Coast (California) it’s September 27, 2015. You can see Andy’s images from the night here, here, and here. Dali hasn’t posted his images from Saturday night yet, but you can find his other work here. This is my 5th and Final image for the 5-Day Black and White Photography Challenge. 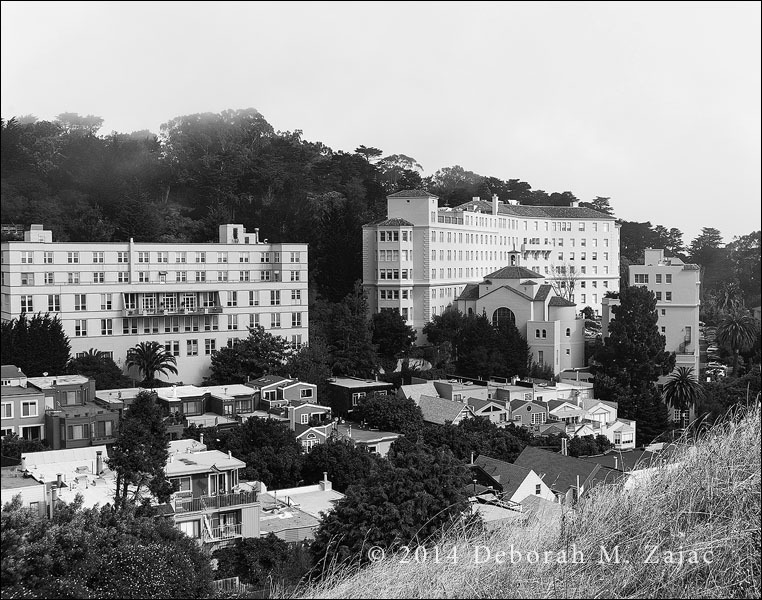 It is an image I made in the Summer of 2012 while hiking the staircases of San Francisco. By mid afternoon the fog started to roll in over the hills. The building is Old St Joseph’s Hospital which was built in 1928. It was added to the National Register of Historic Places in 1985. Today the building is a Condominium Complex.